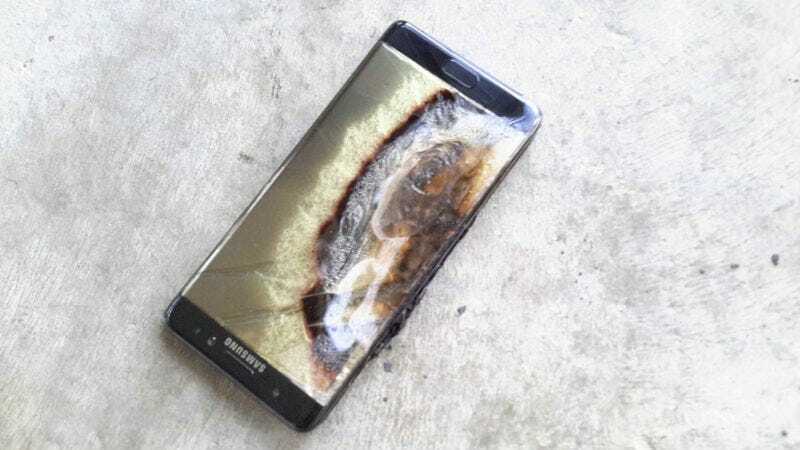 The Transportation Department just banned all Samsung Galaxy Note 7 smartphones from any flight in the United States. Anyone caught attempting to evade the ban may face criminal prosecution, in addition to fines. The ban goes into effect at noon on Saturday, though it’s unclear how effective it will be at keeping the devices off of aircraft since the TSA won’t be actively searching for the devices at checkpoints. The Transportation Department says that if you’re caught with the device, it may be confiscated and you might face fines. And don’t even think about trying to sneak it into your checked luggage. The department says this could lead to increased risk of a “catastrophic incident” and anyone caught doing that could face prosecution. The ban is a collaboration between the Department of Transportation, the FAA and the Pipeline and Hazardous Materials Safety Administration. Flight restrictions were extended to each of the 1.9 million Note 7s sold in the U.S. and the devices now can’t be carried aboard aircraft even if they’ve been shut off, the Pipeline and Hazardous Materials Safety Administration and the Federal Aviation Administration will announce Friday. The news comes just days after Samsung officially killed the Note 7 and announced an expanded global recall. Samsung, together with carriers, is working to communicate the U.S. Department of Transportation’s new order to ban all Galaxy Note7 devices in carry-on and checked baggage on flights. We have encouraged airlines to issue similar communications directly to their passengers. Any Galaxy Note7 owner should visit their carrier and retail store to participate in the U.S. Note7 Refund and Exchange Program now. We realize this is an inconvenience but your safety has to remain our top priority. In addition to the FAA’s advisory, many airlines had already instructed customers that Note 7 devices couldn’t be powered on during the flight. On a United Airlines flight two weeks ago, I even observed flight attendants checking customer phones for potential Note 7 devices. Last week, a Galaxy Note 7 that was reportedly powered off, exploded on a Southwest flight. If an airline representative observes that a passenger is in possession of a Samsung Note7 device prior to boarding an aircraft, the air carrier must deny boarding to the passenger unless and until the passenger divests themselves and their carry-on and checked baggage of the Samsung Galaxy Note7 device. Passengers absolutely should not pack the phones in their checked luggage. And if a phone is spotted mid flight? If a flight crew member identifies that a passenger is in possession of a Samsung Galaxy Note7 device while the aircraft is in flight, the crew member must instruct the passenger to power off the device, not use or charge the device while aboard the aircraft, protect the device from accidental activation, including disabling any features that may turn on the device, such as alarm clocks, and keep the device on their person and not in the overhead compartment, seat back pocket, nor in any carry-on baggage, for the duration of the flight. In the event the phones are banned, our officers would not be searching for the phones. If, in the course of their normal duties, they encounter one at the checkpoint, they would inform the owner that the phone is not allowed on the aircraft and direct the passenger to leave the checkpoint and come back without the phone. If discovered in checked baggage, it would be turned over to the airline. In other words, good luck sneaking a Galaxy Note 7 through airport security. You might get away with it, but you really really shouldn’t be trying in the first place. These devices are dangerous.